Friday May 6th, 2011. Dear Diary, strolling through the centre of our busy little market town this lunchtime, I did but feel a shade overdressed in my humble T-shirt and lightweight Gap cargo trousers. Another day of this wretched heat. Another day without rain. As ever, my companion and I must travel in our eternal quest for both liquid and nourishment. 'bout halfway between highbrow Museum Street Cafe and lowbrow Star Express is 51 Westgate Street, once home (circa 1967) to J. Sainsbury. In 2010 it was GW Timeless Tailoring. 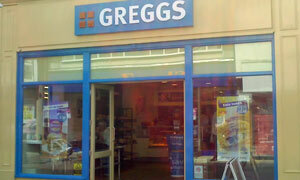 In 2011 it's Greggs, "the home of fresh baking", reg'd trademark. Quartet of high chairs in the corner plus hot drinks has ensured their priceless inclusion in the expanding list. Instant impression is, unexpectedly, one of cleanliness and space, unlike, say, Baker's Oven in that Felixstowe, though I've read that Greggs bought out the BO chain a while back. Savoury options abound. Free sample sliver of their sausage and bean melt would have made Gregg Wallace smile. Size being everything, I'll take the chicken club baguette: Kermode warning, contains mayo. Good 'n' fresh. Occupying exactly half of the available seating, there's visual candy as we observe the beautiful people of Ipswich entering and exiting Superdrug. Andy's succumbed to the £2.99 bloomer meal deal, inc. crisps and drink. Couldn't have a meaningful argument with these prices. Pocketful of change left over for a more-ish maple and pecan swirl and a perfectly fine push-button latte. He's so committed to quality, that Mr Gregg, that he even hand-twists his yum-yums. If it was a car -- Ford Kuga. If they were passing by -- Greg Dyke.